The DZ series of subminiature microswitches from ZF are single pole, single or double throw switches with positive break action on single throw normally closed contacts. The DZ series have a subminiature size of 20mm (w) by 12mm (h) and 6.45mm (d) and come with a choice of solder or quick connect terminations. 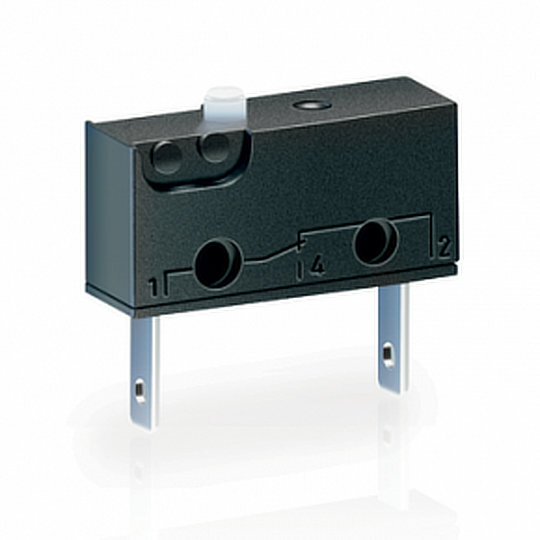 The DZ series of subminiature microswitches from ZF are single pole, single or double throw switches with positive break action on single throw normally closed contacts. The DZ series have a subminiature size of 20mm (w) by 12mm (h) and 6.45mm (d) and come with a choice of solder or quick connect terminations. Electrically rated up to 3A at 250VAC with a mechanical life of up to 1 million cycles the DZ series is available with a wide variety of lever actuators with an operating force of 220cN without lever actuators. The DZ series are perfect for applications such as Home Appliances, White Goods, Linear Drives, Pressure Switches, Pneumatic Valves and Float Switches.